Is Winter the Best Time to Visit Iceland? Iceland is a land of contrasts, of glaciers and hot springs, of darkness and eternal light. When planning your trip to Iceland you should ask yourself, what is the best time to visit? In this post, we are going to talk about the winter season, its pros and cons, to hopefully help you figure out if winter is the perfect season for you to plan your Icelandic adventure. It’s November and it’s getting darker and darker outside. Yet somehow the darkness seems like a warm embrace. After months of constant daylight, it’s time to switch gears, to sit down and enjoy candles, wine and culture, short days and long nights. But the winter doesn’t only bring darkness (although it most certainly brings that in abundance) – it also brings with it opportunities to experience things unique to this part of the world. First and foremost, we have the Northern Lights, AKA the Aurora Borealis. The best time to see this wonder of nature is from October through March. To maximize your chances of getting a good view of this natural wonder, it’s best to have as little sunlight as possible. That being said, we often get the beautiful northern lights as early as late August, if the night comes a little earlier than usual, even if it is just for a couple of hours. It’s not totally uncommon for the people trekking the Laugavegur Trail late in the hiking season to get the show of a lifetime. Northern Lights captured by Norris Niman These lights are special, even for us, and we’ve been lucky enough to witness them countless times. 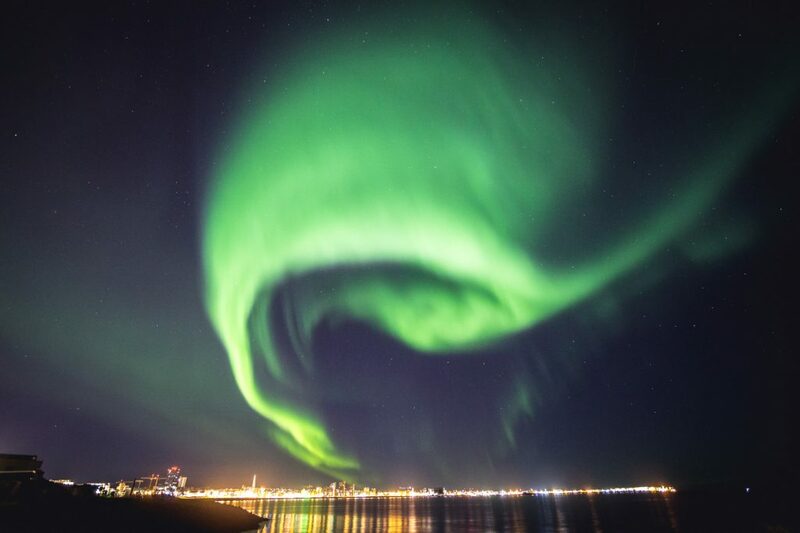 They can be seen when the first lights of the season are spotted over the city of Reykjavik. You will call your mom and tell her to go outside and look up, you’ll write a quick post on Facebook to alert people that may have not yet noticed, you’ll try to make sure that the people you love don’t miss out on this spectacle while you stand there in awe. In short, they are too wonderful to keep to yourself and so unbelievably surreal that having others with you to verify what you’re witnessing isn’t all in your imagination is a good idea. 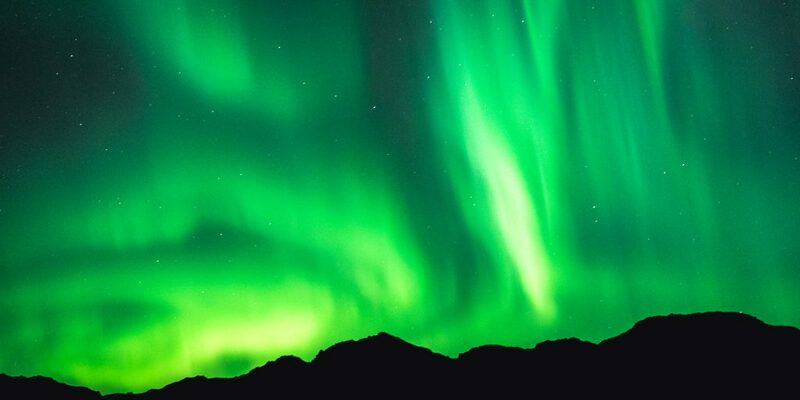 If all of this sounds appealing, you can check out our Northern Lights tours, where we offer 1-day tours right up to 4-day treks allowing you to experience the wonder that is the Aurora Borealis. Next up is the glacial phenomena of the ice caves. Only accessible in winter, these are a once in a lifetime experience for many. Best coupled with a glacier hike or snowmobile ride these can be spotted both in Skaftafell, on Langjokull and often on Solheimajokull. The glaciers on their own will leave you in awe but the ice caves with their crystal blue color take the experience to the next level. Keep in mind that all glacier activities must be conducted by a professional glacier guide, these massive chunks of ice are never to be stepped on (not even for a quick snap) without the right gear and extensive knowledge of the glaciers anatomy. The only way to stay safe is to know what to avoid. See here for a great selection of our Ice Cave Tours. The ice caves and the northern lights are a big magnet when it comes to visiting Iceland in the winter time, but of course, there are plenty of other activities and adventure tours to enjoy if you decide to visit. Skiing has been quite popular in Iceland for some time. Our ski areas (we won’t call them resorts because that is not technically what they are) are small and the mountains aren’t particularly high. Nonetheless, downhill skiing in Iceland isn’t without its charm. 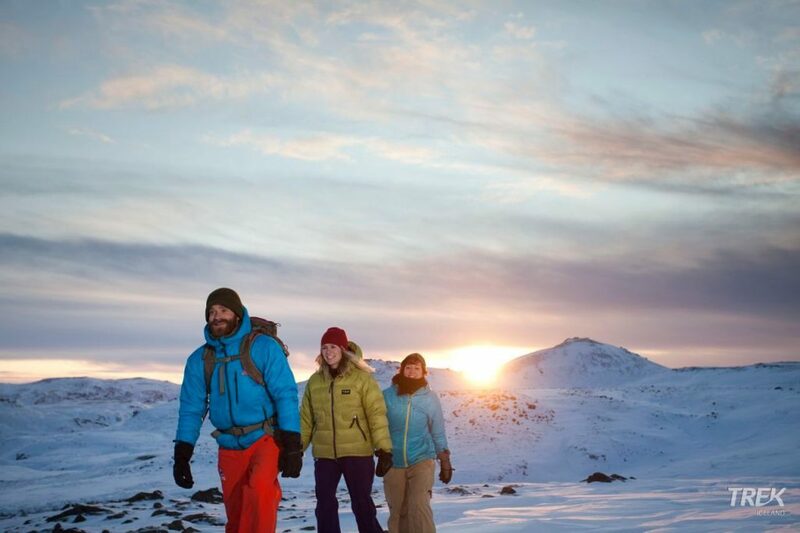 Close to Reykjavik, Bláfjöll (or the Blue Mountains) offer a variety of lifts, making it a great area to visit with kids and is perfect for beginners. If a little more action is your aim, Akureyri, the capital of the north, has a wonderful ski area. The small but incredibly charming towns of Dalvik, Isafjordur and Siglufjordur all have ski lifts and slopes worth exploring. For some more advanced ski expeditions, check out Heliskiing for ski touring in the spring and early summer. 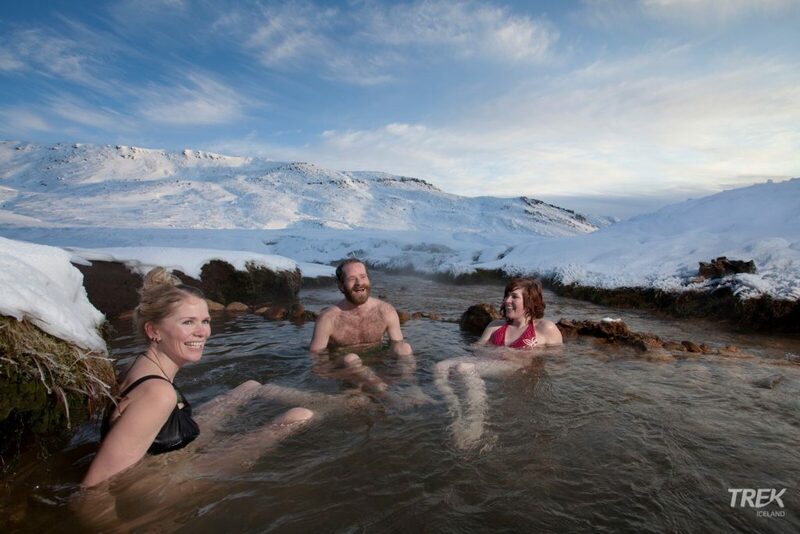 Winter is also prime time for visiting geothermal pools and hot springs. The hot springs in Reykjadalur are always a good way to spend half a day. It’s a relatively easy hike up to a valley where the river mixes with hot springs, making it the perfect temperature for a bath. The Secret Lagoon or Gamla Laugin (the old pool) is a wonderful place to visit on its own, or as a part of a Golden Circle Tour. The Blue Lagoon is always a popular choice and so are a number of the local pools in Reykjavik. If you time your winter visit to Iceland just right, it’s perfect to use the darker hours of the day for a dip, where you could spot the Northern Lights as you float around in the warm water of a hot spring. The pools are also used as a much-needed remedy to soothe tired legs and minds after a long day hiking and exploring. To get the first-hand experience of one of our hiking and hot spring tours, available all year. 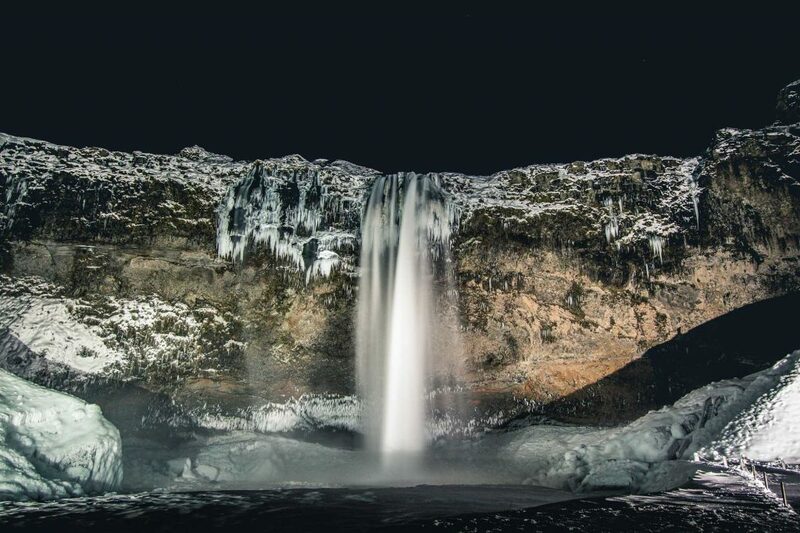 There are a few things to keep in mind if you plan on visiting Iceland in the winter time. First of all, bring the right gear. Getting cold is a sure way to make hunting for northern lights or hiking on glaciers turn into a miserable affair. The temperatures won’t be frigid, but I would advise doing some research on how to layer your clothes in an effective way. Next up is driving. If you aren’t used to driving in snow and strong winds, I would suggest joining a guided tour. There are many economical options to explore Iceland while still joining a tour, the most popular being two and three-day tours in the south and south-east, where hotels are included in the overall price of the trip. If you do decide to rent a car, it’s important to give yourself time, always respect road closings and weather warnings, know the conditions of your insurance and be mindful of other drivers. If you are looking for a driving adventure, summertime would probably be a better option. Iceland is known for its natural beauty and abundance of exciting outdoor activities. All year round you can snorkel, surf, dive, hike on glaciers, explore waterfalls, ride snowmobiles and go whale watching. It’s easy to forget everything else this wonderful island has to offer. There is a huge selection of fantastic restaurants, benefiting greatly from the clean water and high-quality local produce. There are lots of microbreweries, making all sorts of local beers that have in recent years started to make a name for themselves. If you’d like to get a taste of any of the above, then be sure to check out our wonderful selection of Food and Beer Tours. And then there are the festivals. 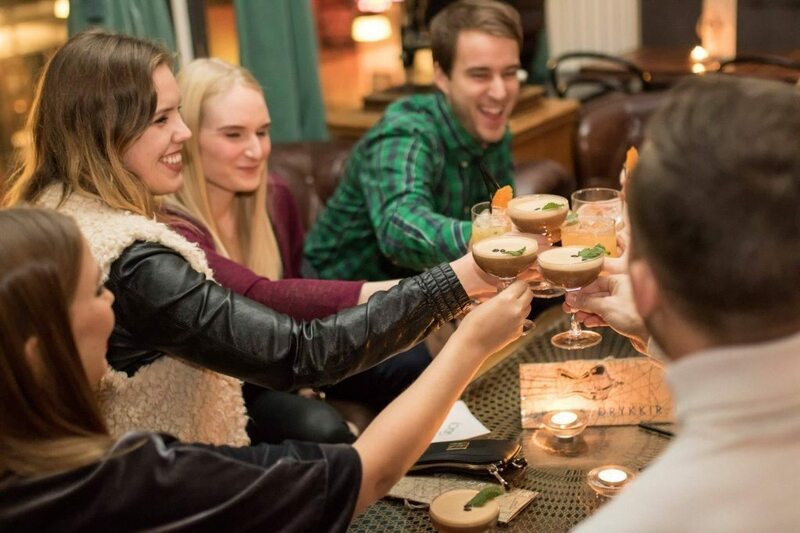 Winter is a prime season for festivals in Iceland where you’ll have everything from music festivals such as Iceland Airwaves in early November and Sónar in February to Design March and Food and Fun, to mention just a few. In conclusion, the winter time certainly has its magic. It’s a wonderful time to hunt for the northern lights, explore ice caves, make good use of geothermal water, eat good food, drink local beer and make new friends. Driving can be difficult and the weather can be unpredictable, but if you are prepared it’s all a part of the Icelandic adventure!